29 weeks with the little bro. I heard about Robin William's passing on the radio while on the way to Laguna. At first I could not believe my ears when the anchor was saying that it was an apparent suicide. I was literally shaking my head in disbelief. How is it a possible that a man who has brought so much laughter to millions of people would want to kill himself? Comedians are often the saddest people. I've heard this many times from comedians themselves. The world mourns this man who has become a ubiquitous figure in many childhoods, youth. 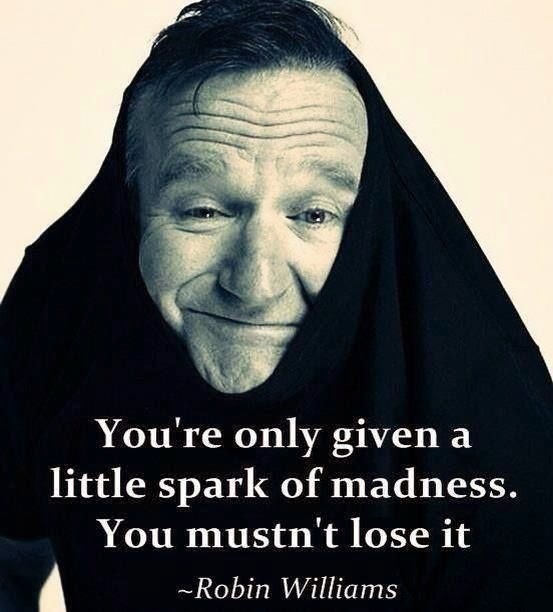 He was Popeye, John Keating, Peter Pan, Jack, Mrs. Doubtfire, Bicentinnial Man, Genie... In one way or the other, he contributed to the romp and fun of our childhood. Russell Brand writes a beautiful piece on him. I did not know this man personally. But he was very much part of my growing up. It's a sad way to go for a man who brought so much joy. I pray for his peace. That's the least I can do for the fun he's allowed me to have. It's breastfeeding week/month and it is somewhat ironic that this might also the end of breastfeeding Alon. See, I'm away for five nights. As he is already two years old and we have another one coming soon, I decided not to bring a pump so this might mean no more milk production when I return. The feeling is bittersweet. I enjoyed nursing my son all throughout and if we weren't having another soon, I'm really not that much in a hurry to stop if he decides he still wants to nurse (some kids decide to wean themselves). I could see the benefits of breastfeeding as he is less prone to getting sick compared to his playmates, his skin is baby smooth, he is lean but full of energy. On the practical side of things, we saved from not needing to buy formula for two years. Now that he is drinking fresh milk, our expenditures for his milk consumption is only a quarter of what it would cost if he drank formula. As a working mom who occasionally travels for long periods (nine days was the longest), it did not come cheap either. I bought lactation cookies to ensure my milk supply, breastmilk bags to store my milk, ice gel packs and fridge-to-go bags to keep the milk cool while in transit. I lugged around a two kilo pump in addition to other stuff I had to bring with me. That was a strain on my back. Airport security always made me nervous due to the carrying of liquid policies. There was a time I carried SEVEN KILOS of breastmilk from Geneva, Switzerland! Alon was more than 18 months when he finally decided to drink fresh milk. It was such a relief! I stopped pumping at work after that. I only pumped when I was traveling to keep the milk supply going. He only nursed at night time or during the day time if we are together. After we got back from Ireland, I gradually weaned him by limiting his nursing before going to sleep and waking up. No more in the middle of the night nursing. Before I left, we were down to sleep time nursing. It was a challenge though (and might still be when I return). Sometimes I'd ask him to stop in the middle of nursing if I feel something in my belly (possibly contractions). He'd cry and say, "last na. konti na lang. please." with sleepy pleading eyes. I'd have to explain that it's hurting Nanay and would have to hug and comfort him until he sleeps. I'm certain that it's more of a ritual than a need but sometimes it is hard for a parent to deny a totally reasonable request from your child. I'm not sure how things will play out when I get back home. I'm hoping he will just be cavalier about it or has totally forgotten that he usually nurses to sleep. If it is truly the end, I would feel a bit of relief but I'd also feel a bit of nostalgia. It would be an end of an era... but one that is bound to begin again in three months. Breastfeeding is not easy. It takes a lot of work and a lot of commitment. It can be painful (I don't remember it being so for me...) and it can be stressful (catching up with the amount of milk your child consumes during the day while you are away) and time-consuming. I would therefore say that it is one of my greatest achievements as a woman and as a mother. It has been a wonderful, personal journey with Alon. I will to do the same with our Little Wiggler.